A bunion is a bony bump that appears on the side of the big toe. Usually the result of ill-fitting shoes, most bunions are harmless. Unfortunately, if your bunion becomes so painful that it interrupts your daily activities, your doctor may recommend surgical removal. The recovery period after bunion surgery lasts for about six to eight weeks. As the pain subsides, you can begin exercising your foot gently to regain mobility in your ankle, foot and toe. At first, you'll need to rest your foot to let it heal. Once your doctor has cleared you for exercise, begin with easy exercises like manipulation. While manipulating your toe, you grasp it with your thumb and forefinger just above the toe joint. Use your other hand to grasp the area under the toe joint and gently pull in either direction while allowing your toe to remain straight. Then, push your toe upward and downward, holding for three to five seconds. This will help you regain movement in your big toe. While bunion surgery mostly affects your big toe, the inactivity can affect your foot and ankle as well. You can exercise from a seated position to avoid pain and pressure on your foot as you recover. Point your big toe and stretch your legs. Curl the rest of your toes under your foot and use your big toe to slowly write out the letters of the alphabet as you swivel your ankle and flex your foot. Once you're done writing the alphabet, write out different names of people, places and things to practice moving your foot. As you become stronger and your recovery progresses, you can add elements to your exercise to help you get a deeper stretch in your ankle and foot. A resistance band can help you exercise from a seated position while giving you the best stretch possible. Loop a resistance band around the arch of your foot or have someone loop it for you. Grip the ends of the resistance band in either hand and use the band to slowly direct your ankle around in different directions. This should not be a painful exercise, so stop if your foot hurts. 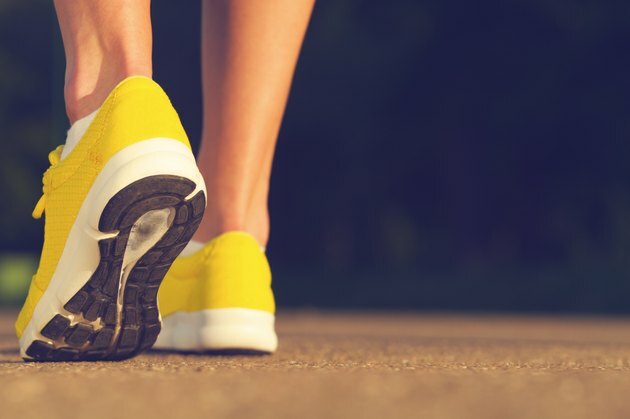 Once you feel well enough to put weight on your foot, short, daily spurts of walking can help you heal and regain movement faster. Start by walking with the aid of crutches and move your recovering foot gingerly. Add a little more weight each day until you can begin walking without crutches. Heed your doctor's warning about exercising or walking too soon after surgery. Take your time and avoid pushing yourself too hard, as it could result in a poor recovery.